James Pollock is a poet of Northwest Passages, a learned Canadian poet with a splendid ear and a Romantic sensibility, a keen explorer of inner and outer states. 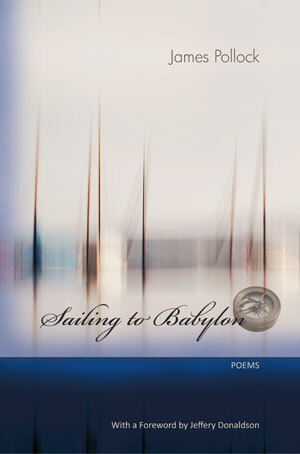 Sailing to Babylon is not only a fully realized and accomplished work of art—it is also a noble book. You will hear in these poems something like the jouncing and ruckus of a wilderness traveler adjusting the gear on his back, steeling his resolve, finding his footings and heading off. In the end Pollock’s departures are an exploration of that inward Northwest Passage where the borderlines themselves between real and imagined, the present and the past, the found and the lost, seem almost to dissolve—passages, as Pollock says, “breaking up within”—and where, in this anthem of mixed voices, our wondering where home is becomes our wandering where home is. . . . I would almost prefer to be the reviewer, or some boastful exegete revealing to readers one hundred years from now some of the untold treasures that, its many readers notwithstanding, lie hidden here still. The metaphysics of the pause, the transition, the image: James Pollock has the Tranströmer instinct, but he plays the music in his very own key. These are haunting, deeply digested, nearly always surprising poems.